Creating and deleting folders is a common routine for any Windows user. 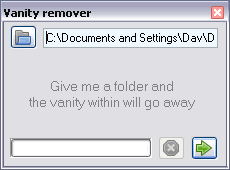 Folder Vanity Remover is a small utility that helps clean up empty folders. It detects and automatically delete empty folders and sub folders from selected folder or drive. It is very light utility with small size of 32KB. 1. Download Folder Vanity Remover program. 2. Double click downloaded file to launch it. 3. Drag any folder into application window or click button to manually select any folder or drive. 4. Click the arrow button, then click yes on the prompt window. Utility will scan the specific folder/drive and will delete the empty folders, sub-folders. In the end you will also get prompt displaying information of number of empty folders deleted by the utility.